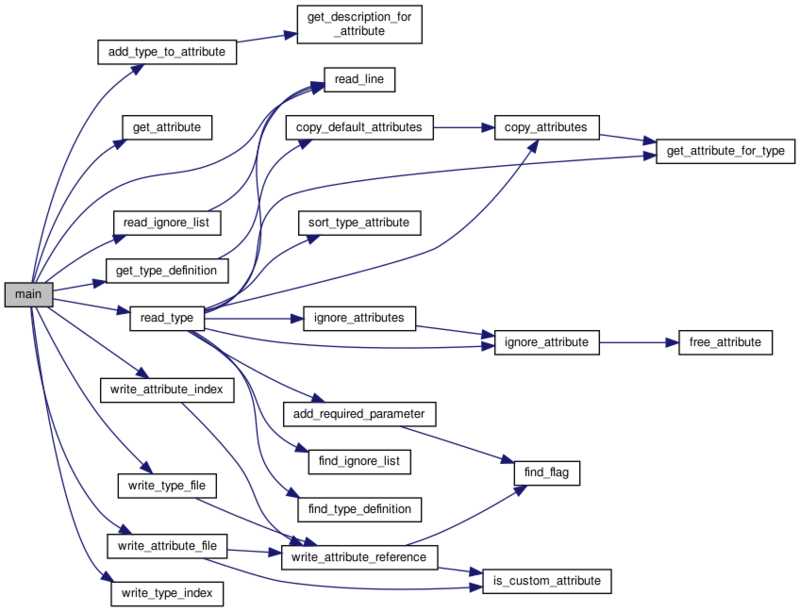 const char * destination_dir = "../doc/Developers"
const char * field_dir = "fields"
const char * type_dir = "types"
This small program will extract information from Gridarta's types.xml file to generate documentation about types and fields. Files are placed in developer's documentation subdirs by default. Note that someone wishing to tweak this program should know the format of Gridarta's types.xml. This program isn't terribly robust, there could be more conditions, and it just doesn't free memory. May be fixed someday, but since it's a "run and exit", not high priority. Note that "attribute" is used for "field in a object/living structure". Add a required parameter to the specified type. buf is the line read from the file, non processed. Definition at line 476 of file gridarta-types-convert.c. References flag_definition::code_name, find_flag(), type_definition::require_count, type_definition::required, snprintf, and strdup(). Definition at line 723 of file gridarta-types-convert.c. References type_definition::attributes, attribute_type::count, type_attribute::description, get_description_for_attribute(), type_definition::name, type_definition::number, attribute_type::number, strdup(), and attribute_type::type. Definition at line 368 of file gridarta-types-convert.c. References type_definition::attribute_count, type_definition::attributes, type_attribute::description, type_attribute::field, get_attribute_for_type(), type_attribute::name, and strdup(). Referenced by copy_default_attributes(), and read_type(). Definition at line 384 of file gridarta-types-convert.c. Definition at line 772 of file gridarta-types-convert.c. Definition at line 659 of file gridarta-types-convert.c. References type_definition::attribute_count, type_definition::attributes, type_attribute::description, type_attribute::field, type_attribute::name, type_definition::name, and type_definition::number. Definition at line 670 of file gridarta-types-convert.c. Definition at line 323 of file gridarta-types-convert.c. References type_attribute::description, type_attribute::field, type_attribute::name, and strdup(). Return flag if exists, NULL else. Definition at line 196 of file gridarta-types-convert.c. Definition at line 428 of file gridarta-types-convert.c. Definition at line 409 of file gridarta-types-convert.c. Definition at line 331 of file gridarta-types-convert.c. References type_attribute::description, type_attribute::field, and type_attribute::name. Get an attribute, create it if it doesn't exist yet. Definition at line 681 of file gridarta-types-convert.c. References attribute_count, attribute_definition::field, and strdup(). Gets the attribute for the specified type. If it doesn't exist, create it. If the attribute is already defined, return the existing one, after cleaning its fields if clean is set. Definition at line 342 of file gridarta-types-convert.c. References type_definition::attribute_count, type_definition::attributes, type_attribute::description, type_attribute::field, type_attribute::name, and strdup(). Referenced by copy_attributes(), and read_type(). Gets a type description for specified attribute, create it if doesn't exist. Definition at line 701 of file gridarta-types-convert.c. References attribute_type::description, strdup(), attribute_definition::type_count, and attribute_definition::types. Returns a new type_definition having the default attributes. Definition at line 393 of file gridarta-types-convert.c. References type_definition::attribute_count, type_definition::attributes, copy_default_attributes(), and type_definition::description. Remove an attribute from the type. Definition at line 446 of file gridarta-types-convert.c. References type_definition::attribute_count, attribute_count, type_definition::attributes, type_attribute::field, and free_attribute(). Referenced by ignore_attributes(), and read_type(). Remove all attributes in the specified list from the type. Definition at line 462 of file gridarta-types-convert.c. References ignore_list::count, ignore_list::fields, and ignore_attribute(). Definition at line 843 of file gridarta-types-convert.c. Referenced by write_attribute_file(), and write_attribute_reference(). Definition at line 1022 of file gridarta-types-convert.c. References add_type_to_attribute(), type_definition::attribute_count, attribute_count, type_definition::description, fallback_type, get_attribute(), get_type_definition(), type_definition::name, type_definition::number, OBJECT_TYPE_MAX, read_ignore_list(), read_line(), read_type(), strdup(), type_count, write_attribute_file(), write_attribute_index(), write_type_file(), and write_type_index(). Read the contents of a <ignore_list> tag. Definition at line 735 of file gridarta-types-convert.c. References ignore_list::count, ignore_list::fields, list_count, ignore_list::name, read_line(), and strdup(). Definition at line 441 of file gridarta-types-convert.c. Referenced by main(), read_ignore_list(), and read_type(). Read all lines related to a type, stop when "block_end" is found on a line. Definition at line 511 of file gridarta-types-convert.c. 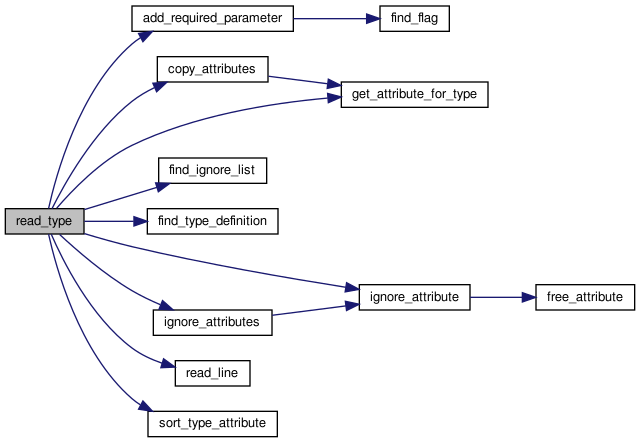 References add_required_parameter(), type_definition::attribute_count, type_definition::attributes, copy_attributes(), type_attribute::description, type_definition::description, find_ignore_list(), find_type_definition(), get_attribute_for_type(), ignore_attribute(), ignore_attributes(), type_attribute::name, type_definition::name, read_line(), sort_type_attribute(), and strdup(). Definition at line 421 of file gridarta-types-convert.c. Write the description of a field. Definition at line 974 of file gridarta-types-convert.c. References attribute_type::count, attribute_type::description, destination_dir, attribute_definition::field, field_dir, is_custom_attribute(), attribute_type::number, snprintf, attribute_definition::type_count, attribute_definition::types, and write_attribute_reference(). Write the index of all attributes. Definition at line 951 of file gridarta-types-convert.c. References attribute_count, destination_dir, field_dir, snprintf, and write_attribute_reference(). Write the part to the right of a @ref for the specified attribute. Definition at line 855 of file gridarta-types-convert.c. References flag_definition::code_name, find_flag(), in_living, and is_custom_attribute(). Referenced by write_attribute_file(), write_attribute_index(), and write_type_file(). Write a type definition file. Definition at line 885 of file gridarta-types-convert.c. References type_definition::attribute_count, type_definition::attributes, type_name::code_name, type_attribute::description, type_definition::description, destination_dir, type_attribute::field, type_attribute::name, type_definition::name, type_definition::number, OBJECT_TYPE_MAX, type_definition::require_count, type_definition::required, snprintf, type_dir, and write_attribute_reference(). Write index of all types. Definition at line 930 of file gridarta-types-convert.c. References destination_dir, snprintf, type_count, and type_dir. Definition at line 91 of file gridarta-types-convert.c. Referenced by get_attribute(), ignore_attribute(), main(), and write_attribute_index(). Definition at line 90 of file gridarta-types-convert.c. Custom attributes we know about, to point to the right page. Definition at line 809 of file gridarta-types-convert.c. Definitions all types have by default. Definition at line 60 of file gridarta-types-convert.c. const char* destination_dir = "../doc/Developers"
Definition at line 31 of file gridarta-types-convert.c. Referenced by write_attribute_file(), write_attribute_index(), write_type_file(), and write_type_index(). Dummy object type that non defined objects use. Definition at line 63 of file gridarta-types-convert.c. const char* field_dir = "fields"
Where the files about the fields will be stored. Definition at line 32 of file gridarta-types-convert.c. Referenced by write_attribute_file(), and write_attribute_index(). Definition at line 100 of file gridarta-types-convert.c. Referenced by add_object_to_socklist(), cfapi_player_message(), compare_flags(), Crossfire_Object_Apply(), enter_player_maplevel(), esrv_update_spells(), esrv_update_stats(), object_update(), query_flags(), readyMap(), remove_adjacent_doors(), roll_ob(), and update_position(). Fields part of the living structure. Definition at line 785 of file gridarta-types-convert.c. Definition at line 73 of file gridarta-types-convert.c. Referenced by dump_ignore_lists(), find_ignore_list(), and read_ignore_list(). Definition at line 72 of file gridarta-types-convert.c. Definition at line 57 of file gridarta-types-convert.c. Referenced by dump_types(), find_type_definition(), main(), and write_type_index(). const char* type_dir = "types"
Where the files about types will be stored. Definition at line 33 of file gridarta-types-convert.c. Referenced by write_type_file(), and write_type_index(). Definition at line 210 of file gridarta-types-convert.c. Definition at line 55 of file gridarta-types-convert.c. Referenced by command_applymode(), command_bowmode(), command_petmode(), command_usekeys(), and START_TEST().